Brad Delong has a nice little piece bashing Milton Friedman, an activity that, within reasonable limits, I consider altogether commendable and like to engage in myself from time to time (see here, here, here, here, here , here, here, here, here and here). Citing Barry Eichengreen’s recent book Hall of Mirrors, Delong tries to lay the blame for our long-lasting Little Depression (aka Great Recession) on Milton Friedman and his disciples whose purely monetary explanation for the Great Depression caused the rest of us to neglect or ignore the work of Keynes and Minsky and their followers in explaining the Great Depression. According to Eichengreen, the Great Depression and the Great Recession are related. The inadequate response to our current troubles can be traced to the triumph of the monetarist disciples of Milton Friedman over their Keynesian and Minskyite peers in describing the history of the Great Depression. In A Monetary History of the United States, published in 1963, Friedman and Anna Jacobson Schwartz famously argued that the Great Depression was due solely and completely to the failure of the US Federal Reserve to expand the country’s monetary base and thereby keep the economy on a path of stable growth. Had there been no decline in the money stock, their argument goes, there would have been no Great Depression. This interpretation makes a certain kind of sense, but it relies on a critical assumption. Friedman and Schwartz’s prescription would have worked only if interest rates and what economists call the “velocity of money” – the rate at which money changes hands – were largely independent of one another. What is more likely, however, is that the drop in interest rates resulting from the interventions needed to expand the country’s supply of money would have put a brake on the velocity of money, undermining the proposed cure. In that case, ending the Great Depression would have also required the fiscal expansion called for by John Maynard Keynes and the supportive credit-market policies prescribed by Hyman Minsky. I’m sorry, but I find this criticism of Friedman and his followers just a bit annoying. Why? Well, there are a number of reasons, but I will focus on one: it perpetuates the myth that a purely monetary explanation of the Great Depression originated with Friedman. After the short, but fierce, deflation of 1920-21 (see here and here), when the US (about the only country in the world then on the gold standard) led the world in reducing the price level by about a third, but still about two-thirds higher than the pre-War price level, the Genoa system worked moderately well until 1928 when the Bank of France, totally defying the Genoa Agreement, launched its insane policy of converting its monetary reserves into physical gold. As long as the US was prepared to accommodate the insane French gold-lust by permitting a sufficient efflux of gold from its own immense holdings, the Genoa system continued to function. But in late 1928 and 1929, the Fed, responding to domestic fears about a possible stock-market bubble, kept raising interest rates to levels not seen since the deflationary disaster of 1920-21. And sure enough, a 6.5% discount rate (just shy of the calamitous 7% rate set in 1920) reversed the flow of gold out of the US, and soon the US was accumulating gold almost as rapidly as the insane Bank of France was. This was exactly the scenario against which Hawtrey and Cassel had been warning since 1919. They saw it happening, and watched in horror while their warnings were disregarded as virtually the whole world plunged blindly into a deflationary abyss. Keynes had some inkling of what was going on – he was an old friend and admirer of Hawtrey and had considerable regard for Cassel – but, for reasons I don’t really understand, Keynes was intent on explaining the downturn in terms of his own evolving theoretical vision of how the economy works, even though just about everything that was happening had already been foreseen by Hawtrey and Cassel. More than a quarter of a century after the fact, and after the Keynesian Revolution in macroeconomics was well established, along came Friedman, woefully ignorant of pre-Keynesian monetary theory, but determined to show that the Keynesian explanation for the Great Depression was wrong and unnecessary. So Friedman came up with his own explanation of the Great Depression that did not even begin until December 1930 when the Fed allowed the Bank of United States to fail, triggering, in Friedman’s telling, a wave of bank failures that caused the US money supply to decline by a third by 1933. Rather than see the Great Depression as a global phenomenon caused by a massive increase in the world’s monetary demand for gold, Friedman portrayed it as a largely domestic phenomenon, though somehow linked to contemporaneous downturns elsewhere, for which the primary explanation was the Fed’s passivity in the face of contagious bank failures. Friedman, mistaking the epiphenomenon for the phenomenon itself, ignorantly disregarded the monetary theory of the Great Depression that had already been worked out by Hawtrey and Cassel and substituted in its place a simplistic, dumbed-down version of the quantity theory. So Friedman reinvented the wheel, but did a really miserable job of it. So I agree that Delong is totally justified in criticizing Friedman and his followers for giving such a silly explanation of the Great Depression, as if it were, for all intents and purposes, made in the US, and as if the Great Depression didn’t really start until 1931. But the problem with Friedman is not, as Delong suggests, that he distracted us from the superior insights of Keynes and Minsky into the causes of the Great Depression. The problem is that Friedman botched the monetary theory, even though the monetary theory had already been worked out for him if only he had bothered to read it. But Friedman’s interest in the history of monetary theory did not extend very far, if at all, beyond an overrated book by his teacher Lloyd Mints A History of Banking Theory. As for whether fiscal expansion called for by Keynes was necessary to end the Great Depression, we do know that the key factor explaining recovery from the Great Depression was leaving the gold standard. And the most important example of the importance of leaving the gold standard is the remarkable explosion of output in the US beginning in April 1933 (surely before expansionary fiscal policy could take effect) following the suspension of the gold standard by FDR and an effective 40% devaluation of the dollar in terms of gold. Between April and July 1933, industrial production in the US increased by 70%, stock prices nearly doubled, employment rose by 25%, while wholesale prices rose by 14%. All that is directly attributable to FDR’s decision to take the US off gold, and devalue the dollar (see here). Unfortunately, in July 1933, FDR snatched defeat from the jaws of victory (or depression from the jaws of recovery) by starting the National Recovery Administration, whose stated goal was (OMG!) to raise prices by cartelizing industries and restricting output, while imposing a 30% increase in nominal wages. That was enough to bring the recovery to a virtual standstill, prolonging the Great Depression for years. I don’t say that the fiscal expansion under FDR had no stimulative effect in the Great Depression or that the fiscal expansion under Obama in the Little Depression had no stimulative effect, but you can’t prove that monetary policy is useless just by reminding us that Friedman liked to assume (as if it were a fact) that the demand for money is highly insensitive to changes in the rate of interest. The difference between the rapid recovery from the Great Depression when countries left the gold standard and the weak recovery from the Little Depression is that leaving the gold standard had an immediate effect on price-level expectations, while monetary expansion during the Little Depression was undertaken with explicit assurances by the monetary authorities that the 2% inflation target – in the upper direction, at any rate — was, and would forever more remain, sacred and inviolable. Trying hard, but not entirely successfully, to contain his astonishment, Paul Krugman has a very good post (“France 1930, Germany 2013) inspired by Doug Irwin’s “very good” paper (see also this shorter version) “Did France Cause the Great Depression?” Here’s Krugman take away from Irwin’s paper. [Irwin] points out that France, with its undervalued currency, soaked up a huge proportion of the world’s gold reserves in 1930-31, and suggests that France was responsible for about half the global deflation that took place over that period. Krugman is on the right track here — certainly a hopeful sign — but he misses the distinction between an undervalued French franc, which, despite temporary adverse effects on other countries, would normally be self-correcting under the gold standard, and the explosive increase in demand for gold by the insane Bank of France after the franc was pegged at an undervalued parity against the dollar. Undervaluation of the franc began in December 1926 when Premier Raymond Poincare stabilized its value at about 25 francs to the dollar, the franc having fallen to 50 francs to the dollar in July when Poincare, a former prime minister, had been returned to office to deal with a worsening currency crisis. Undervaluation of the franc would have done no permanent damage to the world economy if the Bank of France had not used the resulting inflow of foreign exchange to accumulate gold, cashing in sterling- and dollar-denominated financial assets for gold. This was a step beyond classic exchange-rate protection (currency manipulation) whereby a country uses a combination of an undervalued exchange rate and a tight monetary policy to keep accumulating foreign-exchange reserves as a way of favoring its export and import-competing industries. Exchange-rate protection may have been one motivation for the French policy, but that objective did not require gold accumulation; it could have been achieved by accumulating foreign exchange reserves without demanding redemption of those reserves in terms of gold, as the Bank of France began doing aggressively in 1927. A more likely motivation for gold accumulation policy of the Bank of France seems to have been French resentment against a monetary system that, from the French perspective, granted a privileged status to the dollar and to sterling, allowing central banks to treat dollar- and sterling-denominated financial assets as official exchange reserves, thereby enabling issuers of dollar and sterling-denominated assets the ability to obtain funds on more favorable terms than issuers of instruments denominated in other currencies. As Krugman observes, the French economy did not do so badly in 1929-31, because it was viewed as the most stable, thrifty, and dynamic economy in Europe. But France looked good only because Britain and Germany were in even worse shape. Because France was better off the Britain and Germany, and because its currency was understood to be undervalued, the French franc was considered to be stable, and, thus, unlikely to be devalued. So, unlike sterling, the reichsmark, and the dollar, the franc was not subjected to speculative attacks, becoming instead a haven for capital seeking safety. Notice, by the way, that the French weren’t evil or malicious here — they were just adhering to their hard-money ideology in an environment where that had terrible adverse effects on other countries. Just wondering, would Krugman ever invoke adherence to a hard-money ideology as a mitigating factor in passing judgment on a Republican? Krugman concludes by comparing Germany today with France in 1930. Obviously the details are different, but I would argue that Germany is playing a somewhat similar role today — not as drastic, but with less excuse. For Germany is an economic hegemon in a way France never was; it has responsibilities, which it isn’t meeting. Indeed, there are similarities, but there is a crucial difference in the mechanism by which damage is being inflicted: the world price level in 1930, under the gold standard, was determined by the value of gold. An increase in the demand for gold by central banks necessarily raised the value of gold, causing deflation for all countries either on the gold standard or maintaining a fixed exchange rate against a gold-standard currency. By accumulating gold, nearly quadrupling its gold reserves between 1926 and 1932, the Bank of France was a mighty deflationary force, inflicting immense damage on the international economy. Today, the Eurozone price level does not depend on the independent policy actions of any national central bank, including that of Germany. The Eurozone price level is rather determined by the policy choices of a nominally independent European Central Bank. But the ECB is clearly unable to any adopt policy not approved by the German government and its leader Mrs. Merkel, and Mrs. Merkel has rejected any policy that would raise prices in the Eurozone to a level consistent with full employment. Though the mechanism by which Mrs. Merkel and her government are now inflicting damage on the Eurozone is different from the mechanism by which the insane Bank of France inflicted damage during the Great Depression, the damage is just as pointless and just as inexcusable. But as the damage caused by Mrs. Merkel, in relative terms at any rate, seems somewhat smaller in magnitude than that caused by the insane Bank of France, I would not judge her more harshly than I would the Bank of France — insanity being, in matters of monetary policy, no defense. I was pleasantly surprised to receive an email a couple of weeks ago from someone I don’t know, a graduate student in economics at George Mason University, James Caton. He sent me a link to a paper (“Good as Gold? : A Quantitative Analysis of Hawtrey and Cassel’s Theory of Gold Demand and the Gold Price Level During the Interwar Period”) that he recently posted on SSRN. Caton was kind enough to credit me and my co-author Ron Batchelder, as well as Doug Irwin (here and here) and Scott Sumner, for reviving interest in the seminal work of Ralph Hawtrey and Gustav Cassel on the interwar gold standard and the key role in causing the Great Depression played by the process of restoring the gold standard after it had been effectively suspended after World War I began. The thesis independently, but cooperatively, advanced by Hawtrey and Cassel was that under a gold standard, fluctuations in the gold price level were sensitive to variations in the demand for gold reserves by the central banks. The main contribution of Caton’s paper is to provide econometric evidence of the tight correlation between variations in the total gold holdings of the world’s central banks and the gold price level in the period between the end of World War I (1918) to the start of Great Depression (1930-32). 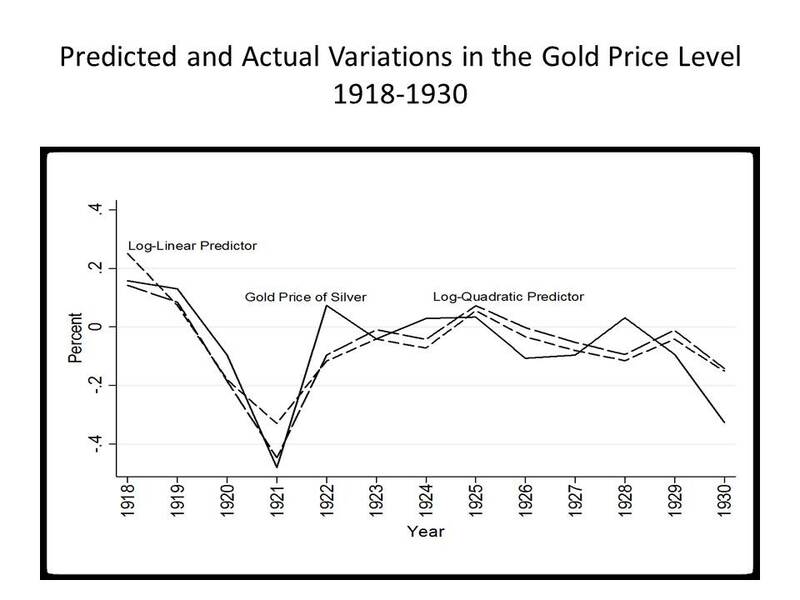 Caton uses a variation on a model used by Scott Sumner in his empirical work on the Great Depression to predict changes in the value of gold, and, hence, changes in the gold price level of commodities. If central banks in the aggregate are adding to their gold reserves at a faster rate than the rate at which the total world stock of gold is growing, then gold would be likely to appreciate, and if central banks are adding to their gold reserves at a slower rate than that at which the world stock is growing, then gold would be likely to depreciate. So from the published sources, Caton constructed a time series of international monetary gold holdings and the total world stock of gold from 1918 to 1932 and regressed the international gold price level on the international gold reserve ratio (the ratio of monetary gold reserves to the total world stock of gold). He used two different measures of the world gold price level, the Sauerback-Statist price index and the gold price of silver. Based on his regressions (calculated in both log-linear and log-quadratic forms and separately for the periods 1918-30, 1918-31, 1918-32), he compared the predicted gold price level against both the Sauerback-Statist price index and the gold price of silver. The chart below shows his result for the log-linear regression estimated over the period 1918-30. Pretty impressive, if you ask me. Have a look yourself. Let me also mention that Caton’s results also shed important light on the puzzling behavior of the world price level immediately after the end of World War I. Unlike most wars in which the wartime inflation comes to an abrupt end after the end of the war, inflation actually accelerated after the end of the war. The inflation did not actually stop for almost two years after the end of the war, when a huge deflation set in. Caton shows that the behavior of the price level was largely determined by the declining gold holdings of the Federal Reserve after the war ended. Unnerved by the rapid inflation, the Fed finally changed policy, and began accumulating gold rapidly in 1920 by raising the discount rate to an all-time high of 7 percent. Although no other countries were then on the gold standard, other countries, unwilling, for the most part, to allow their currencies to depreciate too much against the dollar, imported US deflation. Jim is also a blogger. Check out his blog here. Update: Thanks to commenter Blue Aurora for pointing out that I neglected to provide a link to Jim Caton’s paper. Sorry about that. The link is now embedded.